Tight control of obtrusive light ensures the surrounding buildings and environment are not impacted by only directing the light where it is required. 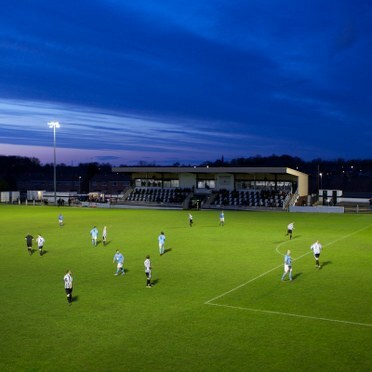 Spennymoor Town Football Club, England, plays in the Northern League Division One in the English football league system. Locally known as The Moors, the club has won the Northern League Championships every year since 2009. In support of its efforts to be promoted, it has also become the first club anywhere to boast Thorn's new Champion floodlights. A recent review deemed the old lights at the Brewery Field grounds, which The Moors rents from the local Council, to be unfit for purpose. 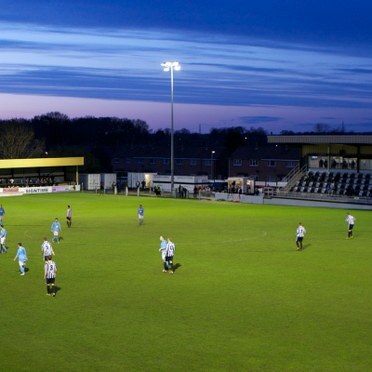 The new Champion floodlights however have put The Moors back in the game, providing performance lighting along with comfort for spectators and local residents. Champion is a compact asymmetric floodlight for 1 and 2 kW metal halide lamps. It incorporates the 'zero cut off' concept and an integrated visor for total control over glare and obtrusive light (0 cd at 90°). A high LOR ensures maximum optical efficiency and accurate light distribution with minimum light spill. From just one installed position, Champion can be adjusted on site to three lamp positions. Championis particularly easy to install and maintain with safe, tool-free rear lamp access and replacement through a hinged door and tool-free aiming in the azimuth due to integrated aiming sights. On opening the rear access door, power supply is automatically interrupted. 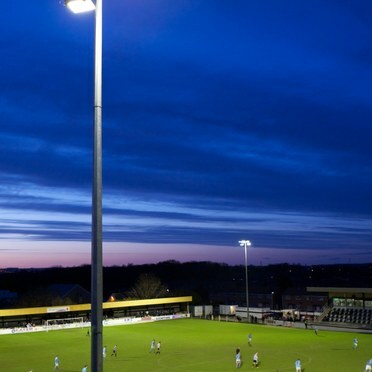 Albert Hickman, who works for Thorn Lighting and has played over 600 games for The Moors had an instrumental role in the installation of the new floodlighting system. He said: "Thorn recognises the importance to the town of having a real successful football club, hence the support from us in providing its first floodlights back in the 60′s (my era) and of course its replacements now. The floodlight fittings are of a new design and will provide high quality lighting levels to meet the stringent FA specification." To the delight of Club Director Paul Callaghan, the new floodlights have delivered a marked improvement in visibility and gone down very well with fans. "We have known for some time that they needed replacing, but it is great to get an improvement up to conference standard," said Callaghan. "We are looking seriously at the possibility of promotion this season, so it is reassuring to know our ground is as good as, if not better than, most of the grounds in the Evostik Northern Premier League. If we do make promotion, we are not going to look out of place."